I’ve been away from blogging for a while. Education funding is suffering mightily in the current economic downturn- as tax dollars drop, so goes education. This is not inevitable. Repeatedly, liberals have attempted to structure education funding mechanisms that were not so acutely tied to revenues. Their efforts are consistently thwarted at every level by conservatives who attempt avoid funding public schools. The compromise that is inevitably reached in this power struggle is that school funding is inextricably tied to variable and fragile funding streams that vary with fluctuations in the economy, and variations in tax rates. Consequently, when taxes are cut, schools also suffer. When taxes are cut in an attempt to create stimulus, during a period of economic downturn and low tax revenues, schools are hit doubly. Localities are then hit with devastating choices of loss of personnel, school closures, large classes, eliminated programs and services, and inevitably: education decline. There are young people’s lives caught in this power struggle. Kids who need help, attention, and special services. Kids who need sports, or music, or technology to thrive; denied. The economic downturn is wreaking havoc on education funding. There is no lesser need for high quality education during recessions. History has shown quite the opposite- that boosts to education and retraining during downturn and vital to economic recovery. I beg our leaders to find a way. I urge conservatives to stop placing public education in the same category as expendable services. 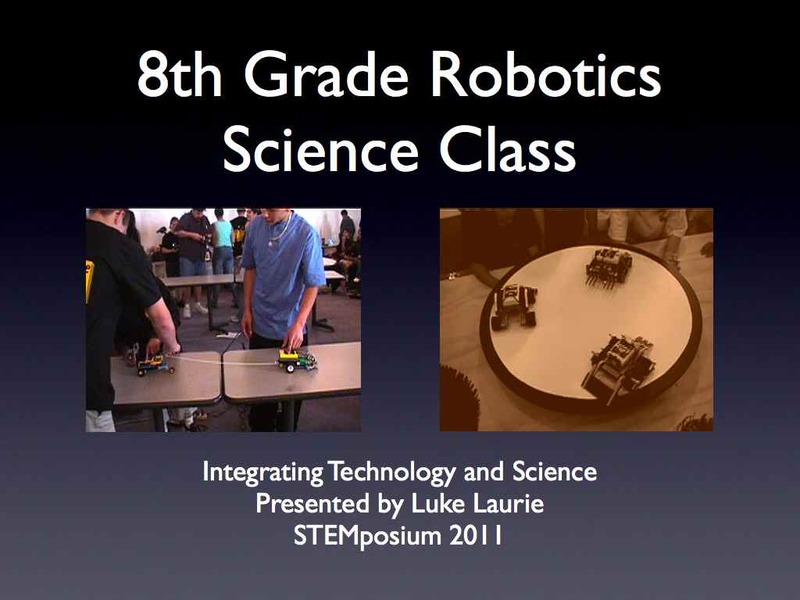 My Robotics science class was the focus of a five minute presentation I recently did at Microsoft’s Mountain View facility, as a Semifinalist for the STEMposium competition, on March 12, 2011. Below are the slides from the presentation, and the script of my remarks. 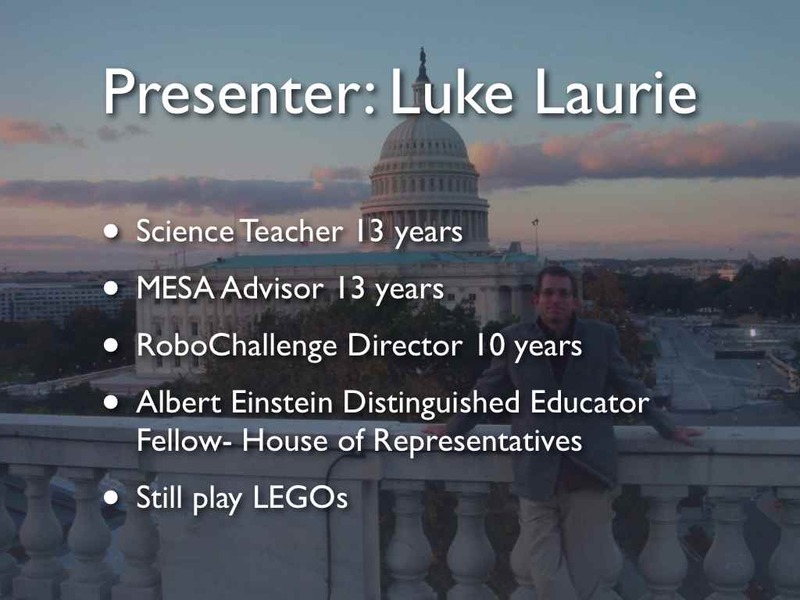 My name is Luke Laurie. 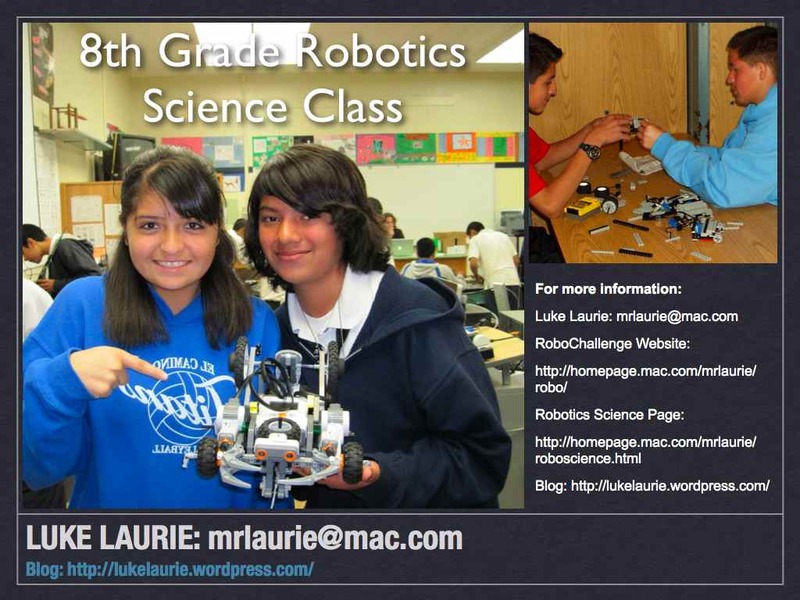 Today I’m going to tell you about the Robotics Science Class that I’ve been teaching for seven years. Let me tell you a few things about myself. Science Teacher 13 years -El Camino Junior High in Santa Maria, CA I teach a student population who are mostly English Language Learners, and almost all live in poverty. My school is not unlike many schools in California. RoboChallenge Director 10 years -A collaborative regional program funded in part by grants from UCSB, providing robotics materials, competition rules, audio-visual and web-based resources, and teacher support to several schools. 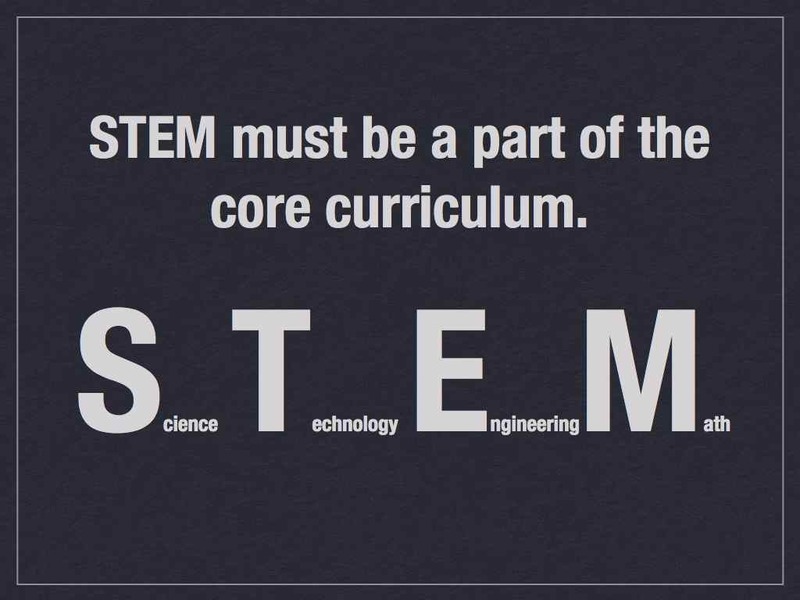 STEM must be a part of the core curriculum. but our students need to know more. We need to ensure that they all have opportunities to explore the concepts of technology and engineering too. To me, it’s artificial to teach Science without integrating technology, engineering, and mathematics. That’s why I created the Robotics Science Class. Kids need more STEM experiences and they need to begin them at a young age to have meaningful impact on their lives. To change the face of STEM, we need to remove the barriers that keep STEM out of reach for most of our students. The best STEM education programs don’t require high costs or major sacrifices, nor steep qualifications to participate. Good STEM education needs to be easy to access. Unfortunately, too often, STEM programs don’t reach the student populations that need them the most, and target their efforts only at small teams in after school settings, or to select students during summer programs. We do have a way to reach all students with high quality STEM education. We have our public schools. And in our schools we need to look at what we’re doing, and make STEM an integral part of our curriculum, and we must implement policies to provide schools with the technical resources, and training they need. By making my class open to all students, during the school day, and part of the core curriculum, I have enabled hundreds of kids from disadvantaged backgrounds to gain STEM skills and experience they might not otherwise have had. My students learn that there are tremendous career opportunities for people with STEM skills, and STEM skills are becoming increasingly important to all careers. 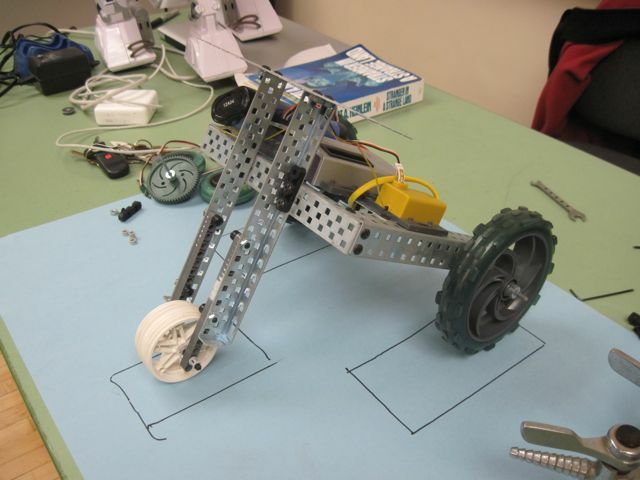 The Robotics Science Class integrates California 8th grade physical science standards with the design, construction, and programming of autonomous robots for a variety of fun and interesting challenges. Students are learning all the California State Standards for Science, including conceptual physics, chemistry, and astronomy, while also learning to use computers and robotics materials as creative tools to solve complex problems. 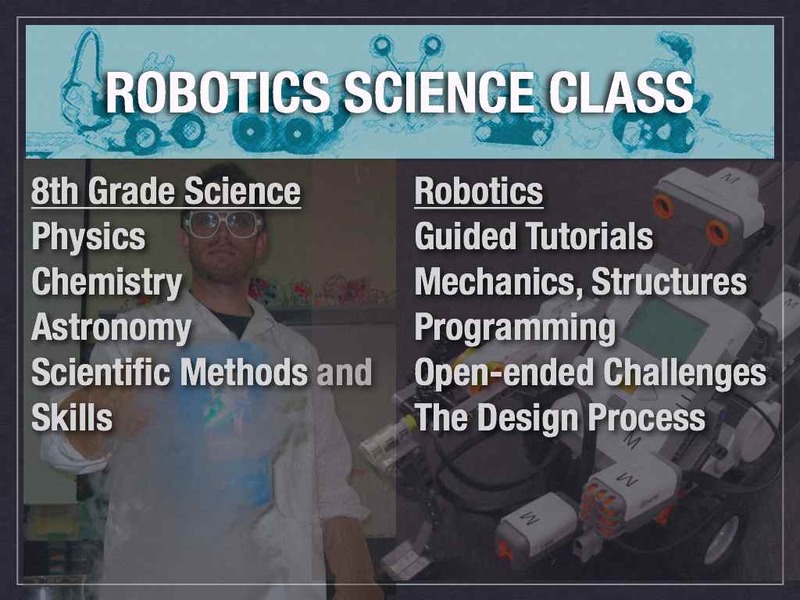 The Robotics Science Class adds technology and engineering to the science curriculum in a manner that is effective and efficient. 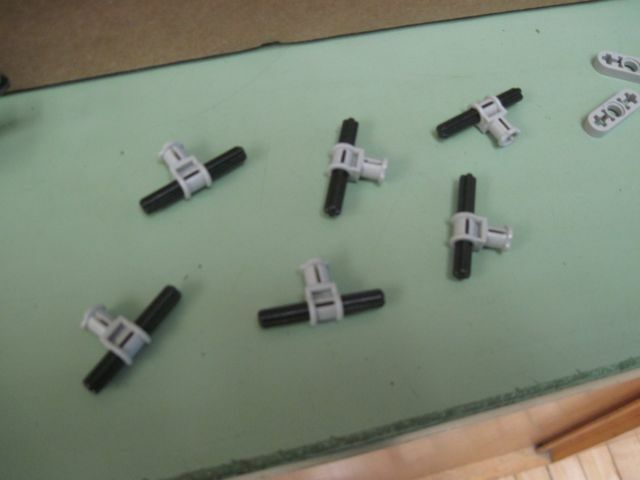 The class primarily uses low cost, durable, flexible, and easy to use LEGO Mindstorms robotics materials, but we’ve used other materials too. 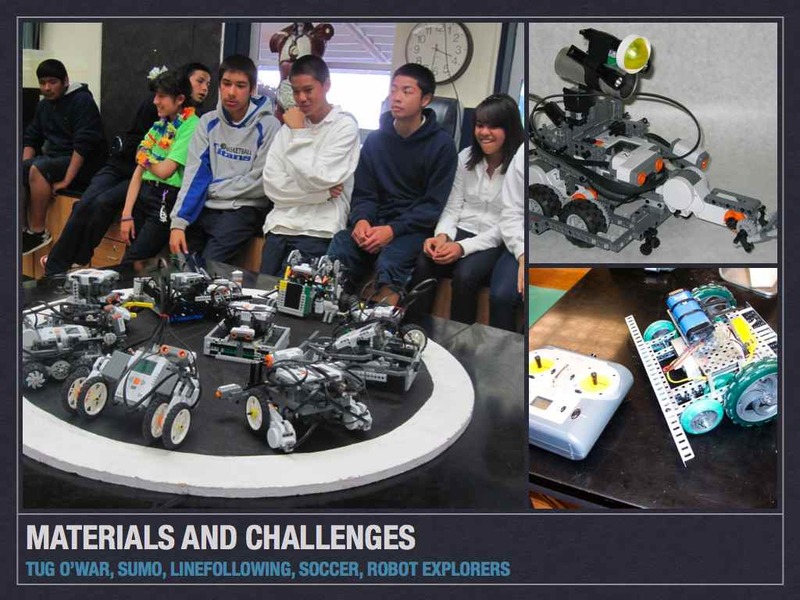 Some of our challenges have included Tug O’War, Sumo, Linefollowing, Robotic Soccer, and Robotic Exploration. 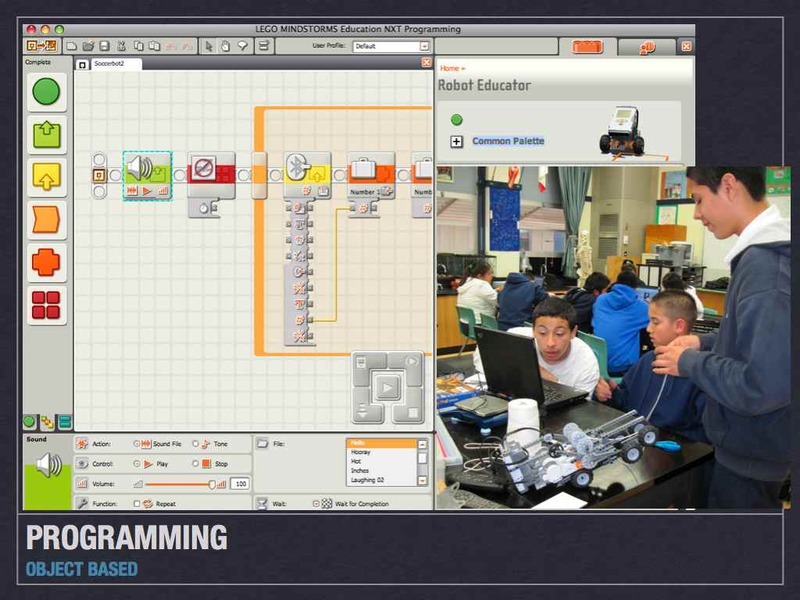 Students learn computer programming concepts using an object-based programming environment where they aren’t stuck dealing with syntax errors and arcane symbols, and instead can focus on the logic of their programs and how to use the sensors and motors to control their robots. 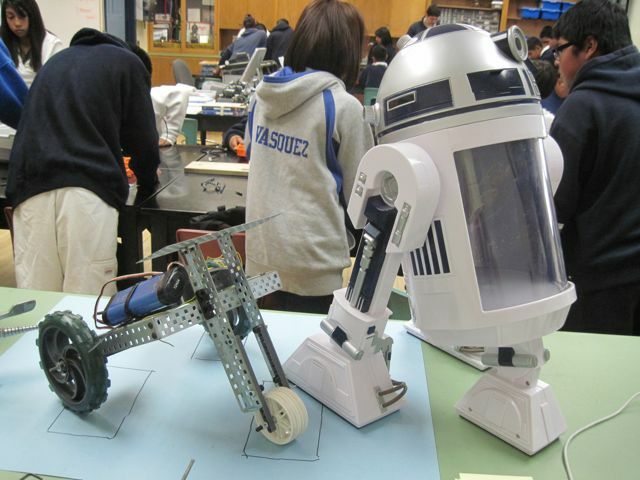 Robotics is a great way to bring all of the aspects of STEM together. 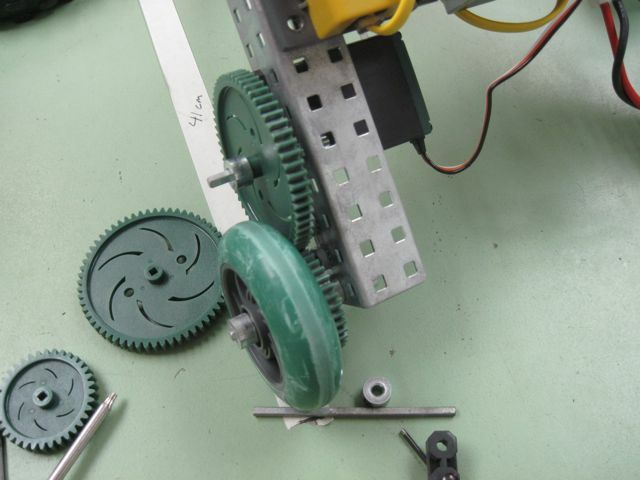 Kids love robots, and the idea of working on them is highly motivating. 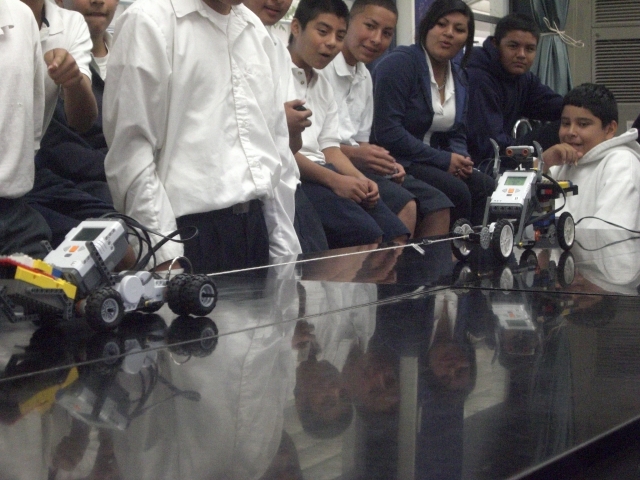 I believe that with more classes like my Robotics Science Class, we will vastly improve STEM education in California. Thank you for giving me the opportunity to speak to you today. If you wish more information on my class or other STEM work I do, please send me an email, or visit my website or blog. 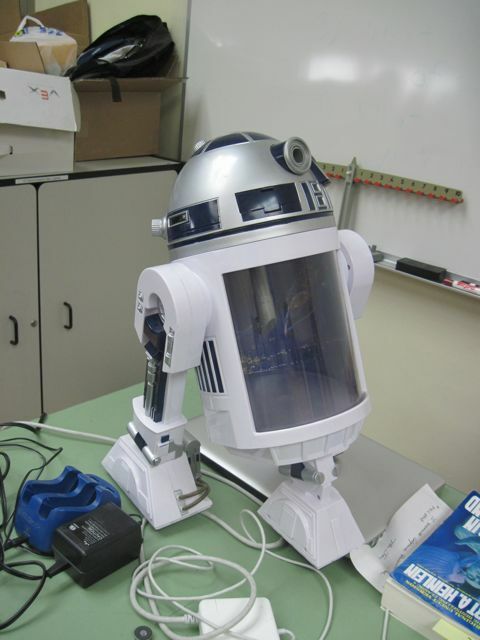 Last time, I talked about how I was building the drivetrain for the remote controlled R2. Click here for Part 1. It’s really important to me that this robot is mobile, and able to drive on smooth ground or carpet, while also being able to overcome bumps and dips. Being able to turn smoothly is extremely important. At first, I had a wheel base of two wheels in the rear two legs providing the mobility, and a single immobile wheel that could roll or slide on a turn. The sliding worked acceptably on smooth surfaces, but just couldn’t cut it on the rug. So, I researched Omniwheels. I found some very cool robots people have built out of LEGOs using omniwheels, and some omniwheels that you can even buy. (I can’t vouch for any of these wheels or the vendor) I love that the internet is full of people’s cool technology projects. 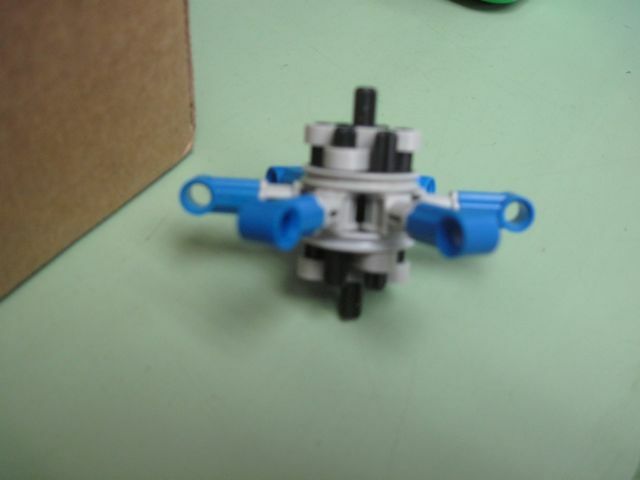 I found a fairly simple Omniwheel design out there somewhere, and attempted several modifications, but in the end, I settled on the design below. This wheel seems pretty effective at allowing R2 to drive forward and backward in a fairly straight line without too many bumps, while also turning pretty smoothly. For now, this is what I’ll use, but I may consider other options. My son received an R2-D2 aquarium as a gift a while back, but we never had it set up with fish. After siting around for a while as a decoration, I got the idea of putting some mechanical and electronic components into it and turning it into a robot. 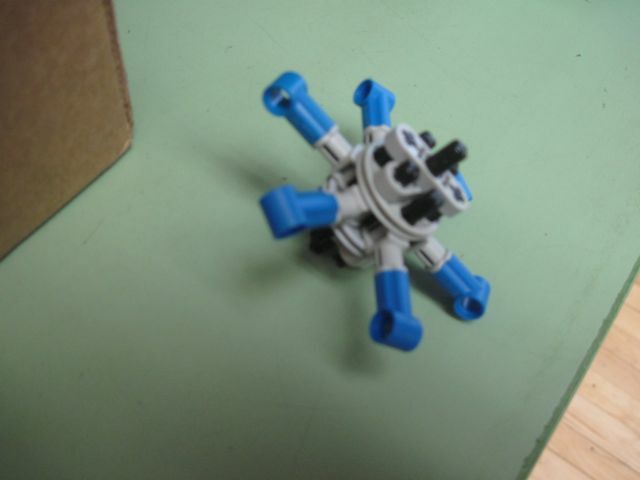 After all, I teach a robotics science class, and have a lot of LEGOs and other parts lying around. By doing this work around my students, I could show them a thing or two about design and troubleshooting a robot project like this. To start, I needed the thing to be able to move, and I decided that it would be most fun if he could be remotely controlled. So I got out some VEX robotics materials that were going unused, and set about designing a driving base to match the R2 shell. I started with a design that had large enough wheels to be pretty quick, but could still carry significant weight. I used some LEGO wheels for the front, which worked OK, but they had to slide around when R2 turned, and would most likely get stuck on carpet. The rear wheels were also too large to fit inside the R2 feet, so they wouldn’t do. Deciding that the rear wheels were two big, I switched to smaller wheels that had about 1/2 the circumference. 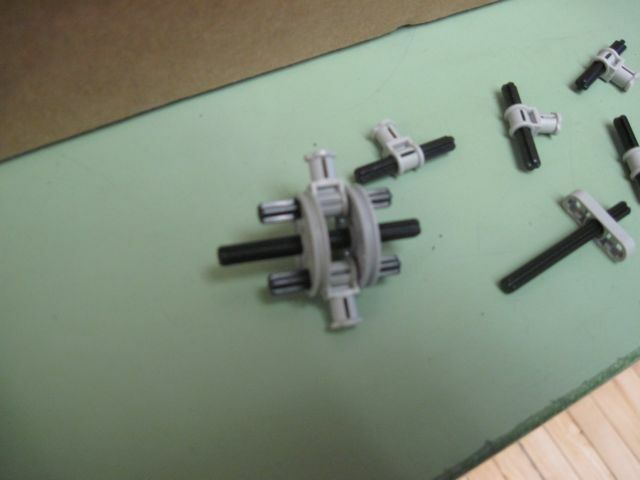 If I attached these directly to the motor in the same way as the larger wheels were connected, my robot would cut its speed in 1/2. That would be too slow for my taste. 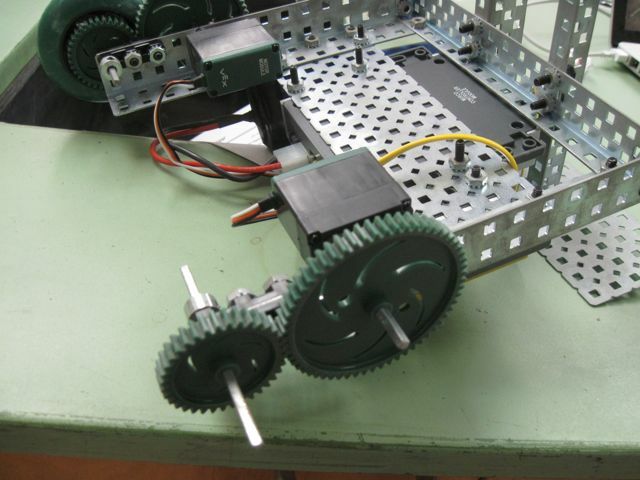 So I put a couple of gears on there- a larger one with about 60 teeth attached to the motor, and a smaller one with about 30 teeth attached to the wheel axle. 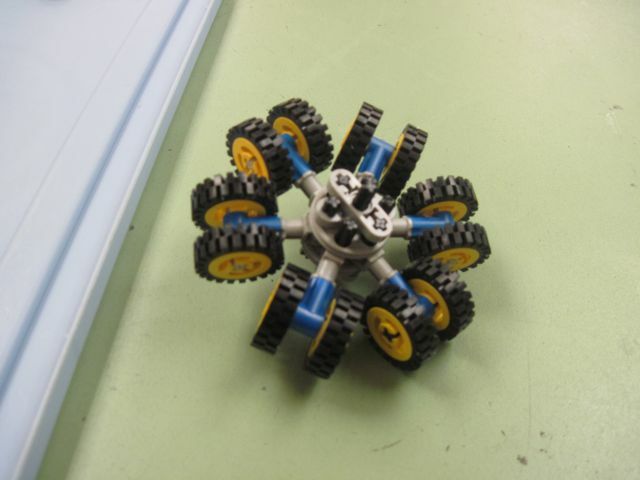 Bingo- the robot speed was right back up to the same speed as with the larger wheels, I just lose a little energy and add a little noise because of the gears. 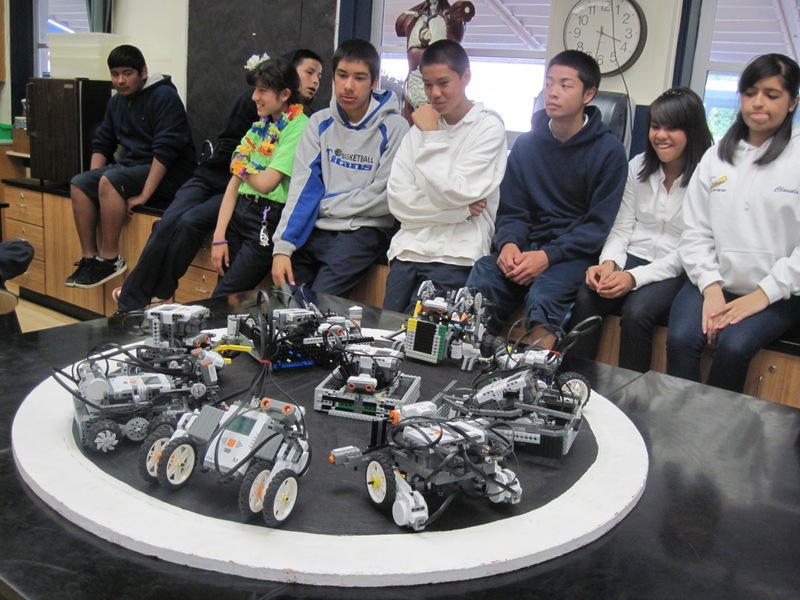 Since the year 2000, I have been working with students on the Central Coast of California, teaching them to build and program robots, mostly using LEGO Mindstorms. 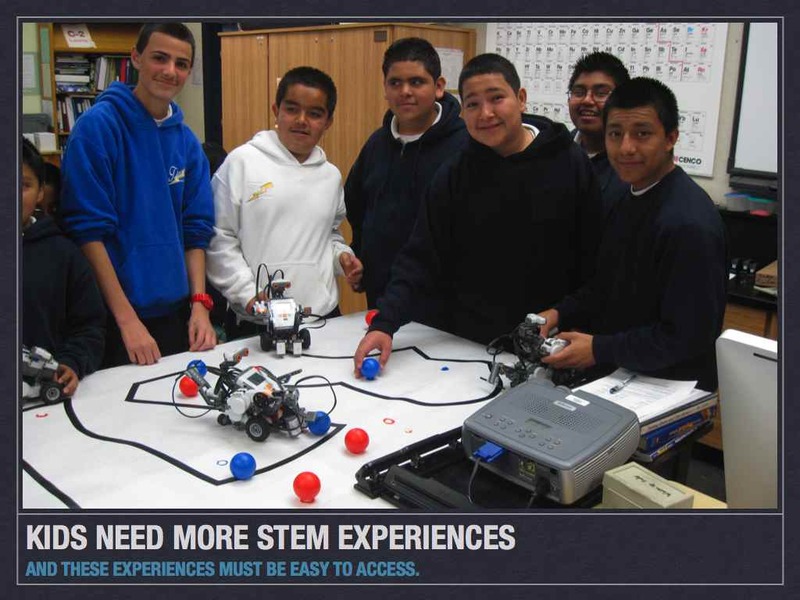 Last year, several MESA centers across California piloted rules I developed for UCSB’s RoboChallenge program. 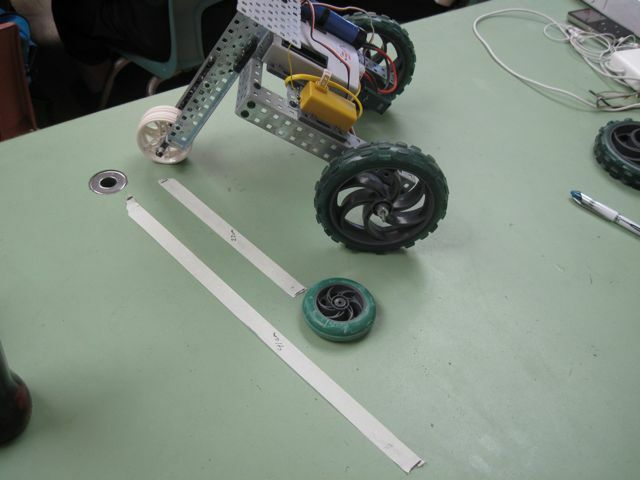 These rules are designed to enable students using most kinds of robotics formats to build Tug O’ War Robots (for Junior High) and Sumo Robots (for Senior High). It appears that some schools and MESA centers will again be using these rules for Demonstration events during their MESA competitions. I’m posting these draft rules to make it easy for students, teachers, and MESA coordinators to find them,along with some additional resources that will be helpful. The rules have not been modified since written in early 2009. ***Note on Sumo: The size of the Sumo board in the rules is somewhat small. A larger board makes for more exciting matches. I prefer a board that is approximately 4 feet in diameter, painted black, with a white border about 4″ wide. The Robotics Science Class has been getting a lot of attention lately, with people asking to visit the class from elsewhere in California, and people wanting to use elements of the class in in Georgia and elsewhere. A book coming out this Summer called “Getting Started with LEGO Robotics,” may feature some of my work, written by Mark Gura and published by the International Society for Technology in Education. 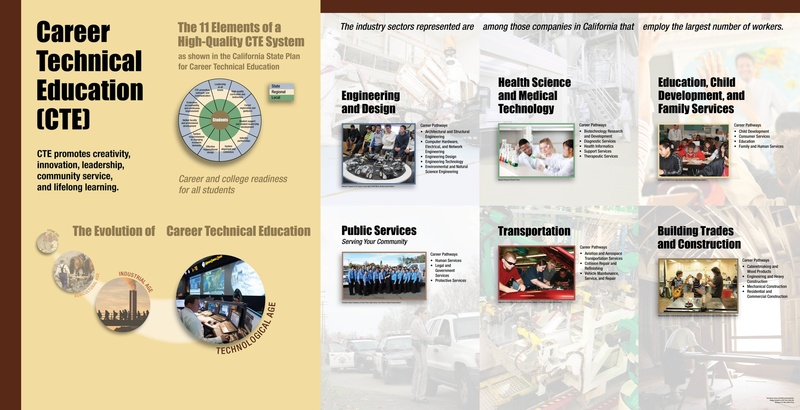 Also, a very cool thing was that a large poster put on display (above) in the California Department of Education about Career Technical Education featured a picture and reference to my Robotics Science Class (look where it says Engineering and Design).